Click here to view The Golden Molecule (2002) on Vimeo. In 2001/02, I embarked on a Master’s course in Science Media Production in London. Part of that course involved making a science-related graduation film or radio programme. I chose to make a film. Since it was 2002, a year before the 50th anniversary of the discovery of the structure of DNA, I thought a re-examination of that discovery would be interesting film to attempt to make. The first step was to identify some interviewees. Back in 2002 the internet was around but it wasn’t as vast as it is now, and the information resources we have today did not exist. Pages on the discovery of the structure of DNA, etc. were few and far between, so the only way to seek any interviewees was to open James Watson’s book, The Double Helix, and page by page note the name of every person mentioned in it. A long list in hand, I returned to the internet and searched for them. Jim Watson, and the late Francis Crick and Maurice Wilkins, were alive, but my £50.00 budget wouldn’t stretch to a visit to the USA in the unlikely event Watson or Crick entertained the idea of an interview with me. So, I approached King’s College London several times to see if I could meet Professor Wilkins – it was a “no” when they eventually replied. I continued down the list without much luck: fifty years is a long time to try and relocate people. Eventually, Peter’s name was next on my list. I found a reference to Peter working at University College London, and a photograph of a laboratory dustbin that had apparently been in Peter’s lab in the Department of Chemistry. And that was it. There was no more information. The road to Abergwenlais Mill. Peter and Alicia lived in a rural part of Wales, the kind of place where you go down long and narrow winding country roads with severe corners. If another car is coming the other way, you clench everything hoping the car would miraculously shrink in size too. It is also a Welsh speaking part of the country where they can spot a stranger a mile away, so locals, though friendly, could be a little intimidating. I have to admit I was nervous as we approached Peter’s home and my mind was focused on getting a good interview. Consequently, I didn’t really notice the Mill itself where Peter and Alicia lived, except that it looked like a large, white, old, rural farmhouse, beautifully nestling in the Welsh countryside. Inside, Peter sat next to a large inglenook fireplace containing a huge wood burner and many logs. I seem to remember too, a spiral staircase that Peter went up to get some photographic plates of his research to show me. The mill where Peter and Alicia Pauling built their home. He chained smoked pretty much throughout our interview. He mentioned cancer and hospital visits and his lungs, and maybe even chemotherapy, but that was in passing. It wasn’t the main topic but it was something that was there. He didn’t complain but only mentioned tiredness. He was certainly a character. Alicia was quieter. A very able lady, she demonstrably kept her eye on Peter as she looked after him and attended his needs. Sometimes she sat in on the interview or stayed mainly in the kitchen. She appeared used to Peter getting visitors from here, there and everywhere and took it in her stride; such as Jim Watson and his wife, who visited them every summer. They seemed a very content partnership. Peter had kindly arranged overnight accommodation for me and my colleague at a local Inn, and it was there we had dinner together before a big interview session the next day. As we walked in, the locals raised their heads to see who was arriving. Established members of their community, there was a murmur of recognition for Peter and Alicia, and some customers raised their glasses in greeting. My colleague and I as strangers, I felt, aroused general interest, but as we were with Peter and Alicia, our presence didn’t seem an uncommon occurrence. Our meals were huge and both Alicia and Peter ate, and drank, and conversed, joyfully. All in all, they were entertaining and welcoming company. Looking back, I am conflicted in a way. It remains of great regret that when I met Peter I knew so little about him outside of the DNA story. Having read more about his research and life since on the Pauling Blog, it would have been interesting ask him about those memories. Conversely, I interviewed the man I met and not the man I’ve since read about, and that is possibly a good thing too. Although our meetings were brief, Peter was an entertaining, joyful and erudite interviewee who liked a drink, to smoke, and to recall stories from the science world he inhabited, and perhaps (he’d admit) somewhat luckily, been a part of. John Kendrew building a model of myoglobin. Credit: MRC Laboratory of Molecular Biology. The Cavendish Laboratory at Cambridge University was an exciting place to be in the 1950s. While James Watson and Francis Crick worked themselves into a frenzy in their race with Linus Pauling to discover the structure of DNA, lab-mate John Kendrew worked quietly alongside another future Nobel laureate, Max Perutz, as they too competed with Pauling in another arena: the molecular structure of various proteins. For Kendrew however, this pursuit was not considered to be a competition against Pauling. Rather, he felt his corner of the laboratory to be working in tandem with researchers at Caltech in their joint pursuit of a common goal. For Kendrew, whoever got there first was beside the point. Indeed, when Perutz and Kendrew received the Nobel Prize for Chemistry – one year prior to Pauling’s receipt of his Peace Nobel – Kendrew credited Pauling as having been a source of inspiration and direction for his work on the atomic structure of myoglobin. John Kendrew and Max Perutz, 1962. Sixteen years Pauling’s junior, John Cowdery Kendrew was born in Oxford, England on March 24, 1917. He received an appointment for study at Cambridge in 1939 and was working on reaction kinetics before the outbreak of World War II called him away to support the Allied effort. By the time that he had reached the rank of Wing Commander in the Air Ministry Research Establishment, Kendrew had developed relationships with several important scientific contacts. Perhaps chief among these colleagues was the crystallographer J.D. Bernal, who also influenced Pauling’s protein work in the late 1930s. Bernal encouraged Kendrew to contact Max Perutz at the Cavendish Laboratory once his military service was completed. After receiving similar advice from Pauling, Kendrew began working with Perutz in 1945. His early research at the lab was conducted in support of his Ph. D. thesis – an x-ray diffraction study of hemoglobin in fetal and adult sheep. Nonetheless, Kendrew and Perutz were avidly pursuing the structure of keratin when the Pauling family visited the Cavendish in 1948. Pauling himself had done some preliminary work on the protein about ten years earlier, but after failing to build a satisfactory chain, he had abandoned the effort and moved on to other structures. Seeing the steady progress that Kendrew and Perutz were making reignited his own interest in the structure. Not long after, while lying in bed with a severe sinus infection, he worked on a rough sketch of a keratin model, which eventually inspired his signature proteins breakthrough: the alpha-helix. Shortly after Pauling published his landmark 1951 paper, “The Structure of Proteins: Two Hydrogen-Bonded Helical Configurations of the Polypeptide Chain,” in which he introduced the alpha and gamma helixes, Pauling invited Kendrew to visit Pasadena and lecture at Caltech. Kendrew, impressed and eager to discuss Pauling’s findings, made preparations to stop in southern California as part of an already scheduled trip to San Francisco and Seattle. The visit proved thought-provoking for both scientists, and Kendrew returned to the Cavendish brimming with fresh ideas. In their early exchange of correspondence, Pauling’s communications (as was typical) were usually formal and brief. On the contrary, Kendrew’s enthusiasm about both his and Pauling’s work is spelled out in long, detailed paragraphs. In due time, Pauling’s writing broadened not only in length, but in a personal dimension as well. Importantly, between a letter dated October 8, 1956 and another written on November 22, 1957, Pauling switched from referring to his correspondent as “Dr. Kendrew” to “John,” and Kendrew responded in kind. Without doubt, one catalyst for this shift was Kendrew’s mentorship and guidance of Linus’ second-oldest son, Peter Pauling, a budding crystallographer who was pursuing his doctorate at the Cavendish. Despite his promise and pedigree, once Peter had settled in, many scientists at Cambridge had begun to express concern about his level of commitment to and interest in his work. Amidst a flurry of letters from Peter’s Cambridge professors that ranged from outright condemnation of his behavior to genuine concern for his future, a 1953 letter from Kendrew comes across as amiable but firm. In it, he expresses serious doubts about Peter’s ability to attain a Ph.D. unless he undergoes “a considerable revolution during the summer.” The message also urges the elder Pauling to alter other travel plans and come to England to address the matter in person. Ultimately, Pauling declined to do so and, fortunately, Peter initiated the revolution for which Kendrew had expressed hope. A year later, Kendrew penned another letter in which he assured Pauling that he had observed in Peter’s work both a genuine interest and a more stringent ethic. Kendrew was not merely a fair-weather supporter of Peter’s endeavors. When Peter ran into serious personal trouble at Cambridge in 1955, Kendrew proved invaluably resourceful. Most notably, he helped Peter transfer his fellowship and remaining doctoral research to the Royal Institution of London, where former Cavendish chief Sir Lawrence Bragg was now directing the Davy-Faraday research lab. Kendrew and Bragg later assisted Peter in moving yet again – this time to University College, London – when he could not complete his dissertation in the requisite amount of time allotted by the Royal Institution. In a number of letters, Pauling repeatedly expressed his gratitude to Kendrew for so carefully tending to Peter’s well-being and educational progress, choppy though it was. These circumstances only served to cement a friendship between the two; one that developed alongside the great professional respect with which they had always extended to one another. Kendrew posing at a proteins conference held at Caltech, 1953. I am writing to ask whether you would be good enough to let me know if you hear of any good man who would like to come to work on the myoglobin project in the near future. As you may have heard from Howard Dintzis, owing to a continuation of unforeseen circumstances I shall be totally without collaborators from January onward. Pauling replied kindly, but did not include any recommendations. In 1957, Kendrew succeeded in delineating the atomic structure of myoglobin. Two years later, Max Perutz successfully mapped the structure of hemoglobin. When Lawrence Bragg approached Pauling with the idea of nominating Kendrew for the Nobel Prize in Chemistry, Pauling suggested that the award be split three ways between Kendrew, Perutz, and Robert Corey, a colleague of Pauling’s at Caltech. Bragg disagreed and instead nominated the British chemist Dorothy Crowfoot Hodgkin, a pioneer in X-ray crystallography. Ultimately, Pauling’s final nomination of Kendrew and Perutz in 1962 included Hodgkin as well. As it turned out, Kendrew and Perutz split that year’s prize, and Hodgkin took the 1964 award for herself. [Scientists] have special knowledge, and their most important responsibility is communication; because it is bad enough to try and foresee the effects of some scientific or technological advance given all the facts, but without them it is impossible…it is all the more important for scientists to communicate and make what they are doing understood at the government level and publicly through the media. Wall of Honor at the European Molecular Biology Laboratory. In the same year that he gave that interview, Kendrew helped to establish the European Molecular Biology Laboratory in Heidelberg, where he acted as director until his retirement in 1981. The lab has since created the John Kendrew Award to recognize and honor outstanding contributions made by the laboratory’s alumni. The Pauling family at Deer Flat Ranch, 1973. Peter stands at left. It was the 1970s, and Peter Pauling was studying the molecular arrangement and physiological effects of hallucinogens. The field of psychopharmacology, crucial to psychiatric treatments of mental disorders, was at the time almost brand new. Only in the 1960s did most physicians begin to consider the potential of psychoactive pharmacological treatments in treating mood disorders and neurologically based physical ailments. The role that different substances played in the alteration of brain chemistry, their influence on synaptic changes, and the modifications in nervous response that they could bring about were all still poorly understood. Peter’s work modelling the structure of different neurotransmitters and psychotropic drugs was part of a larger effort in the late twentieth century that sought to address this gap in scientific knowledge. Many doctors of the era were studying drugs like mescaline, psilocybin, and lysergic acid (LSD). Often, these researchers self-administered as part of the experimental endeavor. Peter Pauling was no exception. His first experiences with LSD came in 1962, when he began receiving small doses regularly as a treatment for his manic depressive symptoms. And while he generally found the results to be agreeable, his brother Linus Jr. was suspicious. A psychiatrist and graduate of Harvard Medical School himself, Linus Jr. advised that the treatment was not in favor in the United States, arguing that it was often prescribed by “unprincipled” doctors. Linus Jr. would later reflect that lithium as a treatment should have been offered to Peter at much earlier point, and that it might have more seriously and effectively addressed his condition. This compelling new research topic in hand, Peter dove into biophysics and psychopharmacology, attending conferences in Moscow and Vienna that inspired him to study drugs and molecules active in the cholinergic nervous system. His electronics work from the 1960s also continued to expand in tandem with his new scholarly focus. The grant that he had received to build his own computer and diffractometer served as the kernel for a grander plan to develop his own data collection facility to research the nature of acetylcholine and other substances. One just pulls up a picture of the molecule and wiggles it around until one gets a pretty view, and punches a button which sets up a file which consists of the entire job input file for another computer to draw the picture. One then rings up the other computer on the telephone and sends the file down to it! To date, no serious consideration appears to have been given to the impact that Peter Pauling may have had on the young field of psychopharmacology during his short but prolific research career at University College, London. He himself saw his work as influential, claiming in 1993 that his goal had been to discover details overlooked by other researchers and lamenting that, in his view, scientists in his own field had, in fact, overlooked these discoveries for years. Peter Pauling, with his mother, nephew and sister, at Deer Flat Ranch. Ca. late 1970s. Peter’s personal life seemed to be improving at this point as well. Having moved out of the slum and into a new flat on Hornton Street, everything looked to be coming together. Early in the decade, Peter began dating a book publishing agent by the name of Bud. The two had originally met at a party in Cambridge years earlier, and before long, Bud and Peter were married, with Peter’s daughter Sarah giving her father away at the ceremony. The couple subsequently moved in together and spent Christmas week in 1971 with some friends in a cottage in North Wales. Peter was enchanted by the place, noting that its Roman tracks and bridges inspired him to imagine someday owning a cottage of his own nearby. But in stark contrast to pastoral dreams of retiring to the Welsh countryside, Peter Pauling’s life had become a blur of work and travel. He flew to Helsinki, Copenhagen, Paris, and Sweden for conference after conference between 1970 and 1978. He also spoke, in 1974, at Peter Waser’s Cholinergic Nervous System conference in Zurich. (Waser had first outlined the role of cholinergic receptors in 1960, and is an early and influential figure in psychopharmacology) Peter even received an honorary MD from the Karolinska Institute at Stockholm in 1972. By now, Peter was also priding himself on his ability to keep what he called the “demon rum” securely in the bottle, though he likewise admitted that his was an ongoing struggle. By 1978, he had been hospitalized about five times – sometimes having himself committed – where he received psychiatric treatment for his depression as well as aversion therapy for his alcohol dependence. He took nicotinic acid and Antabuse to treat his symptoms, and adhered to a steady regimen of small doses of lysergic acid as well. When he was feeling well, Peter rewarded himself for all of his hard work with a new classic car; this time a 1938 Rolls Royce Phantom III with a 7 liter, V-12 engine. Meanwhile, by 1972, Peter’s ex-wife Julia had finished both a teacher’s training degree as well as a bachelor’s degree in Education. The children also seemed to be flourishing: Thomas had joined his school’s rowing team, finishing in the top eight and winning a pewter cup in one race, and Sarah was beginning secondary school. The next year, Peter spent Christmas with Sarah and Thomas for the first time since 1966, after which his visits to both of them became more frequent, especially with Thomas. In 1979, Thomas joined his father for a trip to California to see his grandparents, Linus and Ava Helen Pauling. Sarah accompanied Peter and Bud on a separate holiday that Peter admitted was an “eye opener,” showing him that he and his daughter could connect on a level that he hadn’t been sure was possible. Before long, Sarah was heading off to the University of Bristol, and Thomas was coming up on his final exams at Sussex. Much like his father, Thomas possessed a mind that was mechanically focused, delighting in daydreams of designing bicycles or of someday becoming an electrical engineer. In 1980, Thomas took a position at an engineering firm working in “forecasting expenditure,” and living in the same Hornton Street building as his father. Sarah would later complete a bachelor’s degree in Biology and a master’s in Forensic Science, ultimately forging a career in pathology at the UK Home Office. By the early 1980s, Peter had entered into a romantic relationship with another woman, Alicia, a librarian and classics instructor who lived in the same apartment building as he. Bud had moved out, and though she wished to maintain contact after their separation, Peter was less open to the idea. He preferred to continue to see Alicia, their “on again, off again” relationship percolating for many years before the two finally married. And though they took their time before sealing their vows, Alicia pretty quickly became a crucial fixture in Peter’s life, providing much needed support when tragedy repeatedly struck. In 1981, Ava Helen Pauling, in failing health and suffering a recurrence of stomach cancer, decided against chemotherapy. She passed away on December 7th at the age of 77. Not long after, Peter lost his son Thomas, who, in 1983, died tragically at the young age of 26. The next year, Peter was admitted to the Queen Mary’s Hospital burn ward in Roehampton, where he received surgery to aid in his recovery after unintentionally setting his mattress on fire in the middle of the night. The final Pauling family portrait, taken on occasion of Linus Pauling’s 85th birthday. Pasadena, 1986. Peter stands at far left. In 1986, Peter accepted an offer to take an early retirement from his job at the University of London. His academic career now concluded, Peter channeled his energies into fulfilling the vision that had first occurred to him in 1971: a small home in Wales. After many trips spent looking at properties, Peter and Alicia eventually came across a house that was adjacent to an isolated and run down mill out in the countryside of Dyfed. Through the ground ran a stream, part of which was diverted into a sluiceway to motivate the wheel. Inside the mill was still the mechanism for transferring energy from horizontal to vertical grindstones, which had big doors on each side so wagons could go in underneath and get loaded up and then on out the other side. Only a small portion had been made barely habitable, with running water and a bathroom, and what passed for a kitchen. The Welsh countryside was beautiful. The place suited Peter. Peter and Alicia married in 1991, taking a trip around the world as their honeymoon, and paying visits to Linus and Linus Jr. along the way. The next year, Alicia retired from her university job and sold her London flat, moving full-time into the house by the mill in Wales. But she continued to travel back and forth and remained academically active in her spare time. She also brought to the mill a number of cats that Peter considered “bloody awful things” on the grounds that they preyed on the local birds. It was optimistic; but only just. Alicia returned permanently to the mill a month later than planned, and the pair lived out their lives there together among the old Roman roads, the green hills, the grey skies, and the deep winter snows. Peter Pauling died on April 22, 2003. He was 72 years old. Peter Pauling, speaking at his father’s sixtieth birthday party, Los Angeles, 1961. Journeying on their honeymoon through the caves of northern Spain, Peter Pauling and his wife Julia arrived at a small fishing village and made camp. His beard full and his hair grown to nearly his shoulders, Peter sat on the beach, scouring pots. Meanwhile, Julia watched the water, contented by the meal that she had just prepared for her new husband. She had always loved the sea, saying as much in her letters to Linus and Ava Helen Pauling, her new parents-in-law. Julia had been a bright student at Cambridge. An avid reader of French and German literature, she was once hailed as the year’s best student at Girton College and had received the highest marks possible in her first year examinations, an achievement that surely would have impressed Linus and Ava Helen. Given the circumstances of their marriage however, Peter and Julia had their work cut out for them in attempting to smoothing things over with both sides of the family. As she attempted to do so in her communications, Julia was especially complimentary of the Paulings’ new property at Big Sur. In particular, she swooned over the “heavenly” view of the Pacific Ocean, as observed from the coastal bluffs of California. Upon their return to London, the pair moved into their new home in Clapham, which Peter described as “an ugly Victorian suburban house that ought to be quite pleasant.” Many things changed for Peter as he settled into his new life. With the help of his mother and younger brother Crellin, he shipped his Mercedes back to the United States where it would eventually be sold. He had likewise traded in his most recent automotive conquest, a Porsche, upon his and Julia’s return from their honeymoon. The proceeds from these sales and trades were used – with added financial help from Peter’s parents and his older brother Linus Jr. – to purchase a new home for the family at Lansdowne Road. That name didn’t stick, however, and within a month, Peter was writing to his mother and father that their new granddaughter, Sarah Suzanne, had begun to smile and sleep all night. It was one of many letters in which Peter expressed joy at being a father. Within five years, Peter would excitedly report that Sarah was reading bedtime stories to him, rather than the other way around. By this time, young Thomas was at the top of his class as well. Peter and Julia enjoyed a great deal of support from friends and family during these early years. Typically, the couple would spend the Christmas holiday season with Julia’s parents in the north of England, while the Pauling family would usually visit at various points throughout the year. Occasionally, Peter’s sister Linda and her husband Barclay would see the young family, bringing their twin boys “Barkie” and “Sasha” in tow. Linus and Ava Helen often came through London while on European trips for conferences, bringing with them comfort items from the States as well as more important cargo, such as the polio vaccine. Even Jim Watson dropped in, meeting young Thomas, who loved to turn all the knobs on a sprawling electronic gramophone that Peter had pieced together from spare parts. The room was a hopeless mess, Watson noted, and surely the bane of Julia’s existence. On top of that, Thomas’ interventions generally scrambled the music until it was incomprehensible. Buoyed by a little help from his friends, Peter’s career took a positive turn as well. Lawrence Bragg had agreed to take Peter on at the Royal Institution for three months, in order to allow him to finish his degree. When three months turned out to be not enough time, Bragg and John Kendrew conspired with their colleague Jack Dunitz to obtain for Peter a position as a research student, working under R.S. Nyholm at University College, London. Once there, Peter would be allowed to continue his education while simultaneously collaborating with Dunitz to complete his research. The arrangement worked. Peter switched the focus of his dissertation from protein crystallography to inorganic molecules, using x-ray diffraction to verify configurations of a halide compound, NiCL4. Peter likewise worked with a number of other transition metals, performing stereochemical experiments to determine their atomic structures. At the same time, Peter began working with his father to develop a theory of the molecular structure of water, a subject on which he had spoken at a meeting of the Royal Society in 1957. After the two Paulings developed their theory, which postulated a random dodecahedral structure for liquid water, Peter became quite prolific. Throughout the late 1950s and 1960s, he published just over thirty papers, including fourteen in 1966 alone. He also became much more active in the field, flying often to the United States for meetings of the Crystallographic Association, as well as other conferences in locations from San Diego to Denver to Pittsburgh. Having completed his PhD in 1959, Peter was immediately offered a lectureship in Chemistry at University College. And though he continued to muse in his letters to Ava Helen that he really didn’t want to do chemistry forever, he quickly accepted the position. Julia and Peter Pauling at the 1963 Nobel Peace Prize ceremony in Oslo. At long last, Peter seemed finally to be stepping out from his father’s shadow. And importantly, one sign of this transformation was his own realization that he was not, and could never be, the chemist that Linus Pauling was. Instead, Peter began to focus his efforts on computers and other electronic systems valuable to the lines of chemical research that he had been pursuing. Among the rash of papers that he published in 1966 was “A Program for the Use of Large Computers for Crystallographic Problems,” which appeared in the British Journal for Applied Physics. Here, Peter was finally in his element, working at the forefront of a field that was swiftly changing, engineering devices by hand, and building complicated electronics systems such as a “one dimensional diffractometer” for x-ray crystallography – or what Peter called an “automatic gadget” – from plug-in logical blocks. Peter took the first steps toward an important milestone in this new line of research, when he ordered a computer and electronic parts that he thought would be necessary to produce a copy of the state of the art diffractometer and visualization systems then in use at Oak Ridge National Laboratory, the American research center founded in 1942 as part of the Manhattan Project. Funded by a Public Health Service grant, his system-in-progress deployed an ex-military scope equipped with a preamplifier, a Schmitt trigger, a monostable pulse generator (used to trigger the scope), and a Sherwood FM tuner that he had acquired from Linus Jr. The tuner in hand, Peter spent almost a year tracking down its circuit diagrams, so that he could most effectively cannibalize it in support of his cobbled together atomic measurement machine. Once completed, not only did Peter’s device work, it worked marvelously. By May 1968, his computer and the program that ran it were making thousands of minute measurements per week. Indeed, the apparatus was used to determine the structure of five compounds in a ten-week period; a volume of calculations, as Peter pointed out, that was visually represented by four miles of punched paper tape that the computer had to read in producing the work. This huge success stood in stark contrast to Peter’s years at Cambridge, where he had struggled mightily to adequately determine the structure of a single compound. With his machine, Peter Pauling was attempting to make University College technologically competitive with an institution that had received major support from the U.S. Atomic Energy Commission during the height of the Cold War. Astoundingly, he accomplished this goal using, to a large degree, spare parts. Later, Peter would use the measurements from his device to improve the Caltech method for drafting pseudo-perspective drawings of molecular structures, producing instead Third Angle Projection-style drawings of atoms and their bonds. As his successes mounted, he was promised a lab that would be four times larger, and was elected President of the Chemical and Physical Society of University College, London. Behind the scenes, however, Peter was struggling to balance his career with his family life, and was plagued by personal demons. Ever since leaving Cambridge a decade earlier, his mother had been worried about his mental health, urging him to see a psychiatrist about his struggle with manic-depression. Over time, this view came to be shared by a growing number of friends and family. But burdened as he was by the competing forces of a new wife and children, the completion of his degree, and the press of research and professional obligations, there never seemed to be a good time. At one point, Linus Pauling became so concerned for the welfare of his grandson, Thomas, that he offered to arrange for the boy to live in Pasadena for as long as might be necessary for Peter’s domestic situation to stabilize. Peter responded that he was far too busy writing his thesis and preparing lecture courses at University College to fly Thomas to New York. A few months later, he revealed that Julia was pregnant with their second child. But as the decade moved forward, Peter Pauling found that he had other struggles of his own to worry about. By 1967, he and his wife had agreed to a divorce. Peter subsequently moved into a flat in dodgy area of London – St. John’s – where he shared his new space with a painter. The flat was later robbed, and Peter lost most of his clothes and jewelry, as well as his radio, as loss that he lamented. (“I used it all the time,” he wrote, “to fill up the empty holes in my head when I am alone.”) Likewise stolen was a pot that his sister Linda had given him for Christmas. He wrote to her that he missed this item the most, as it meant more to him than anything else that was taken. Linus Jr. came to London to visit his brother during this time, and ultimately left the scene both worried and relieved. The worry came from the fact that Peter, by his own admission, was drinking and smoking far too much. On the other hand, Linus Jr. felt a measure of relief that his brother had finally done what he thought was right for his children: leaving the family home at Lansdowne Road to Julia, Thomas, and Sarah. Julia and Peter Pauling, 1956. The year 1954 was a tumultuous one for Peter Pauling. For one, Jim Watson had left for Caltech, and Peter lamented that his absence was felt, as he was “a positive force, albeit a bit conceited” when it came to social dynamics in the lab. At the same time, Peter’s sister Linda was preparing to move to Cambridge, where her father hoped that Peter might help her to find lab work assisting with crystal structure determinations. (Linda was quite interested in mathematics.) His sister’s imminent arrival excited in Peter visions of European exploration, and especially of skiing. But while Peter dreamed, serious matters were afoot at the Cavendish Laboratory. Its director, Sir Lawrence Bragg, was planning to resign his Cambridge professorship to take a position as head of the Royal Institution in London. Meanwhile, the lab’s incoming director of physics, Nevill Mott, was widely known to be of the opinion that the unit’s increasing focus on biology needed to be redirected. John Kendrew was worried that the MRC unit that he and Max Perutz headed might be kicked out of the lab, or even the department, entirely. This uncertainty both distracted Kendrew from Peter’s lack of progress on his myoglobin work, and, in retrospect, made Peter’s lack of enthusiasm for his topic all the more glaring. Indeed, while John Kendrew was worried about the future of their research, Peter was writing to his father that he was unconcerned about Mott’s approval. Rather, as was so often the case, Peter’s main preoccupation was his vehicle, this time a 1930 Mercedes Benz open touring car, described as “18 feet long and mostly engine,” that Peter was now cruising in for special occasions like the May Ball at Peterhouse. Peter’s older brother, Linus Jr., had forwarded him money to purchase the car, hoping that it would be affordable to rebuild the engine. When the cost of doing so turned out to double his investment in the vehicle, Linus Jr. thought it more expedient to simply let his younger brother have the car. Linus Jr. and Peter formed a strong relationship during Peter’s years at Cambridge, a time period where Linus Jr. and his wife Anita made a habit of travelling around Europe during the summers. This closeness marked something of a renewal of the brothers’ relationship since they had seen little of one another during their more formative years, and as children had little in common. Now, cars in particular emerged as an area in which the two could share their exuberance. Linus Jr. reflected later that, on those trips abroad, he and his wife enjoyed Peter tagging along – his vitality, beaming smile, and friendly nature made him the life of any party. But this was clearly only one side of Peter Pauling. Privately, he admitted to his mother that he often felt unsure of his path in life, and that he felt unable to meet the challenges of his PhD program. He often wondered whether or not he would be better off simply teaching chemistry, or helping to write his father’s textbooks. These bouts with gloom were contrasted by sudden and excited turns to sociability. 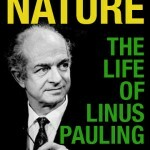 Linus Jr. would later point out that their paternal grandmother – Linus Pauling’s mother, Belle – was possibly manic depressive, and was reported to have died in a mental hospital. This, he believed, was likely where Peter had inherited his own emotional instability, and it was during his stint in Cambridge that manic depressive symptoms started to manifest most clearly. The Paulings in Stockholm, December 1954. Credit: Svenskt Pressfoto. Linus Pauling’s frustration with Peter’s hoax “Francis Crick letter” had faded by the time that the entire family met in Stockholm for the 1954 Nobel Prize ceremonies. It was there that Pauling was to receive his highest honor to date, the Nobel Prize for Chemistry, commemorating his work on the nature of the chemical bond. After a frustrating battle to receive government permission to leave the country – by then, Linus’ political activities were causing him problems with the Passport Office – the Pauling family flew to Copenhagen where they met Peter and Linda. By then, Linda had taken up residence in the basement room that her brother had just left at the “Golden Helix,” as the Crick home on Portugal Place was now known. Once arrived, she worked for a time as Francis and Odile Crick’s au pair. Watson returned to the Cavendish in 1955 to find the MRC unit on the verge of being squeezed out by Nevill Mott. Finally registering this threat, Peter began to panic, writing to implore his father that he vocalize his positive impressions of the unit’s work and that he recommend that the group be allowed to continue their research there. At the same time, Peter applied for a post-doctoral fellowship grant from the National Science Foundation, hoping to solidify the standing of both himself and the group by bringing additional research money into the lab. As it turned out, Peter’s maneuver worked: he received the grant, and this was no doubt a boon to his position at a crucial time. It did little to help him in his research, however. He continued to struggle with myoglobin and, increasingly, he placed his fading hopes squarely upon the idea that mercuric tetraiodide ion crystals might be a better candidate for the sorts of analysis that Kendrew and Perutz were beginning to doubt he could complete. As the final year of Peter’s program dawned in fall 1955, the frequency of his drives about the grounds to impress the girls dropped to what Jim Watson considered a startlingly low level. Perhaps realizing the “do or die” position that he was in with respect to his research, Peter seemed to be redoubling his focus on finishing his degree. During this same period, Peter had begun seeing a young woman by the name of Julia, who was a student at a nearby all-women’s school. Jim Watson, curious about the situation, queried several girls that he knew from the school, but most were silent, and Julia herself became conspicuously absent as the New Year drew closer. We have a real need here for someone who has had the sort of experience in taking x-ray photographs of crystals that you have obtained. I think our effort to determine the complete structure of a crystalline globular protein is going to be successful, and that you might like to be associated with the successful effort. Peter did not respond immediately, taking about a week to think about the proposal. It may well be that he was simply overwhelmed by both the work to be done and the festivities to be had during his final months at Cambridge. Plus, it seemed that the job his father had offered likely would be waiting for him as soon as he had finished his program in England. Few had seen much of Peter in the run-up to Jim Watson and Linda Pauling’s practical joke of a dinner party. In response to a rumor that Watson and Linda were seeing one another, the two decided in good fun to host a get-together, thus driving speculation into a frenzy by implying an impending announcement that, in fact, was never to come. Peter was invited and did show up, but much to the surprise of the hosts, he was not his usual grinning, charming self. Instead, he seemed sentimental and full of a solemn interest in the future of his friends at Cambridge. Watson and Linda later realized that, on this particular evening, Peter was wrestling with a weighty issue: he was soon to become a father. The Pauling family on Christmas Day, 1956. Peter and Julia sit at right. A letter sent by Peter’s parents in early 1956 concluded with an expression of excitement: Linus and Ava Helen would be visiting soon and would look on with pride as they witnessed their son receiving his Cambridge Ph.D. In his response, Peter explained that this day, sadly, would never come. Though he felt that she was a “clever, delicate, and lovely girl,” Peter had not made Julia an “honest woman,” and for this he would be sent down from Cambridge and not be allowed to take a degree. Accordingly, this also meant that he would not qualify for the position that his father had offered him at Caltech. When he learned of his situation, John Kendrew suggested that Peter might be able to transfer both the remainder of his fellowship with the National Science Foundation, and also the completion of his doctoral research, to the Royal Institution in London, where Sir Lawrence Bragg – his old program director at the Cavendish – was now director of the Davy-Faraday research lab. By then, however, Peter had decided to marry the mother of his child, and arrangements were quickly made by Linda Pauling for a quiet civil wedding that was out of the spotlight and not attended by Linus or Ava Helen. Peter and Julia were married on March 13, 1956 at the Cambridge Register Office on Castle Hill. Peter’s bride was given away by her father, and with no family members other than Linda present, Peter’s sister acted as the sole adjudicator of the Pauling family’s approval of the union. Peter’s Cambridge advisor, John Kendrew, stood with him as his best man. Following the wedding, a reception was held at Kendrew’s home at Tennis Court Road, after which Peter put on his trademark grin and, with Julia, vanished in a new Porsche. Before the year was out, Linda Pauling, struggling financially and burdened by an expired work visa, returned to Pasadena. Between 1957 and 1959, Kendrew and Perutz successfully modelled the molecular structure of myoglobin that Peter had been working on. In this, the Cavendish once more beat Caltech to the punch, as the position that Linus had offered to Peter was meant to contribute to a similar problem. Myoglobin was the first ever protein to have its atomic structure determined, and Kendrew and Perutz shared the Nobel Prize in chemistry for this achievement in 1962.